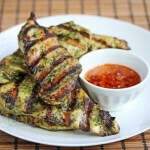 This Grilled Thai Chicken with Sweet Chili Garlic Sauce is perfect for a quick and easy dinner. Made with ready-made pesto, it comes together quickly. 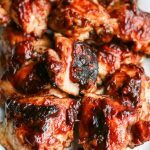 This Grilled Thai Chicken with Sweet Chili Sauce is something I threw together for dinner one night when I was late getting dinner started. As the school year winds down, dinner time seems to become less scheduled (which is a good thing) and less organized (gets those creative juices flowing). More days than not lately, I find myself scrounging through the refrigerator to see what I can whip up for dinner quickly. During the school year, we typically eat dinner around 6PM, but recently, dinner was served near 8PM. My boys were wondering what happened to their normal dinnertime. I’m thankful that it’s grilling season – it makes for no-fuss meals and less cleanup. 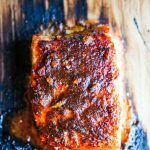 I’m looking forward to making two of our family favorites, Grilled Salmon with Thai Coconut Curry Sauce and Thai Coconut Curry Chicken with Peanut Sauce soon. Garlic scapes are one of the first spring crops that can be found at our local farmer’s market. I love making pesto with garlic scapes at the start of the season. 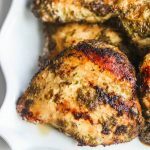 Although pesto tossed with pasta is one of my go-to meals throughout the Spring and Summer, this recipe for grilled chicken is a great way to use some of my Garlic Scape Cilantro Swiss Chard Pesto. The pesto is mixed with some soy sauce before slathering on thin cut boneless chicken breasts. 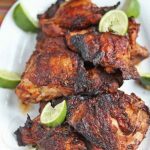 There’s a traditional Thai grilled chicken that is marinated with cilantro paste – this barbecue Thai Chicken is a twist on that dish. 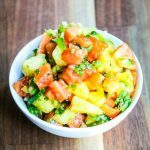 Served with a Sweet Chili Garlic Sauce, a simple salad and rice, this makes a quick and easy dinner. Mix Pesto and soy sauce together. Rub all over chicken breasts and let marinade for 1-2 hours if possible (if not, don't worry, you can grill right away). Make Sweet Chili Garlic Sauce by combining all sugar, water, rice vinegar, garlic and salt in a saucepan. Bring to a boil, then reduce heat and simmer until it reduces and thickens slightly. Add chili-garlic sauce. 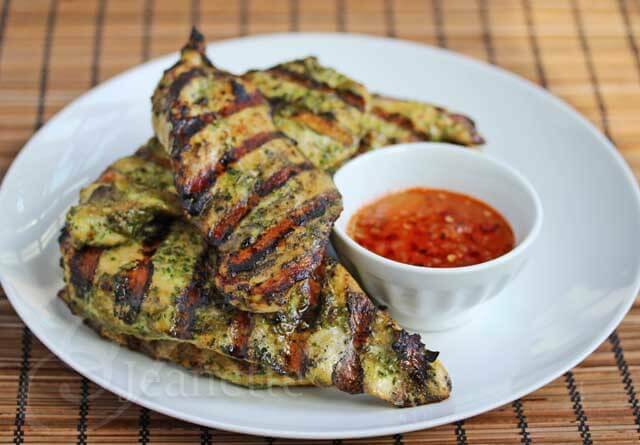 Serve Grilled Thai Chicken with Sweet Chili Garlic Sauce. We LOVE to grill around here and my husband is a big fan of Thai food flavors…. this is the perfect recipe for us to try this week! Looking so forward to trying more of your recipes and being a regular reader! Ooo, this looks fabulous, Jeanette! 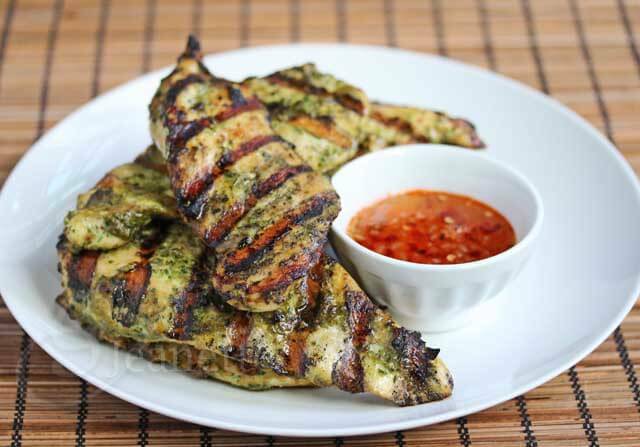 I love that you marinaded the chicken in cilantro pesto and served it with that scrumptious, spicy sauce. A must-try in my house, for sure! Thanks Georgia, I love making pesto in the summertime with all the fresh herbs and veggies available. Enjoy! Oh wow, this sounds so good! I definitely have to try this recipe. Thank you for sharing. 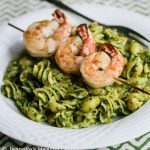 That garlic scape pesto sounds divine! Thanks Alyssa – I grab as many garlic scapes as I can every summer for pesto and stir-fries. What a wonderful combination of flavors! I occasionally get half a dozen or so garlic scapes in my herb garden, and I’m definitely going to try this recipe if they appear this year. Thanks Lydia – I wish I had your herb garden – I always look forward to garlic scapes at the beginning of the growing season. I get mine from our local farmer’s market. What is the season for garlic scapes anyway? I couldn’t find any (we have a farmer’s market twice a week only) and used garlic cloves as a substitute. It still came out divine. We loved this dish! Another one checked off the list! Thanks! Cristina, garlic scapes have a very short season and come up in the earliest part of the summer here on the East Coast. I’ve gotten them in my CSA box and from the farmer’s market. They have a mild garlic taste. Garlic cloves are a great substitute – they’re just stronger. So glad you enjoyed this recipe – thanks so much for letting me know! Thanks Alison! Been super busy with the end of the school year as I’m sure you are – can’t wait to take a breather! 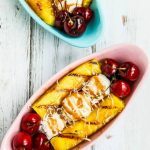 This looks so delicious and I love how easy it is! We are counting down the days until school is over. For some reason it always seems so much busier than usual business at the end of the school year-3 more to go-hurrah!! Thanks EA – two of my kids are out and two have another 2 weeks to go – can’t wait until we’re all on the same schedule (or non-schedule ;)). You come up with the best flavours of chicken, Jeanette! This is going on my to-grill list. 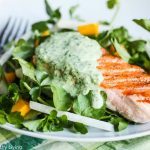 Thanks Sommer, Carolyn, Nami – this is great for summer grilling – the sweet chili garlic sauce makes this dish! Kelly – this is an easy recipe and the chili sauce is great. Hope you have a chance to try this. I love everything about this. Those flavors! Thanks Russell – we’ll be making this a lot this summer! I love the flavors of this chicken recipe. I am always looking for new ways to flavor chicken! 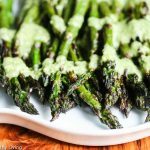 I love the pairing of the garlic scape pesto with the sweet chili sauce. It looks fantastic! What can be substituted for garlic scapes? we dont have any where we live. Carolyn – you could use garlic cloves instead of garlic scapes – I would use 4-6 cloves, depending on size and how garlicky you like it. Made this last night for my boyfriend and I and we both loved it. I couldnt find garlic scapes at my local supermarket (might be out of season?). I replaced it with minced garlic and some basil leaves. Turned out great! I sprinkled some melted cheese on top of the chicken and made some rice on the side and this was one awesome dish! Will be making again soon! 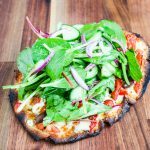 Mollie – so glad you had a chance to try this recipe and loved it. Garlic and basil leaves sound like great substitutes. Thanks for sharing!